Right now, our garden is overgrown with fresh basil and cherry tomatoes, so I came up with this recipe trying to use what we have on hand. I always think one of the greatest gifts you can give your child is a garden, even if it's a little pots of herbs on the window sill. Having the experience of planting seeds and watching them grow into an herb, fruit or vegetable is just an amazing process for kids to be a part of. It's one way that they can truly appreciate and feel connected to the food they eat as well as learn about the world around them. For this recipe, Kenya and I loved going out into the garden to pick our ingredients, rolling into the kitchen to whip up the pesto, skewering the fish and peppers onto the kebobs and then heading out to the grill to cook up this delicious summertime entree. This is easily one of my favorite healthy recipes that everyone in our family enjoys. 1. Place all the ingredients in a bowl and toss to combine. 2. Preheat oven broiler or grill to high heat. 3. 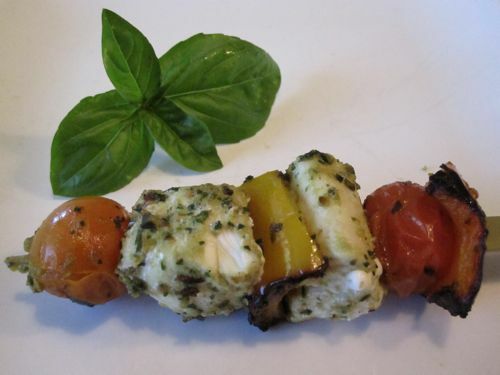 Place vegetables and fish on skewers (if using wooden skewers soak in water for 30 minutes to avoid burning). 4. Cook skewers under broiler or on grill for 6 minutes, turning halfway through. Thanks for your entire effort on this web site. Kate takes pleasure in conducting research and it is easy to see why. Almost all learn all of the powerful tactic you give important ideas on this web blog and even invigorate contribution from website visitors about this matter so our own daughter is always being taught a lot. Take pleasure in the rest of the year. You are always doing a wonderful job. Can you use scallops instead of the halibut? If so, how would that change the cooking time? Thanks!